Ever wish you could take your dog along for a stroll when it may be too hot for his or her little paws or you are going a little too far for their little legs? Now you can with Doggy in Wonderland's fashionable pet strollers and joggers! We have a variety of pet stroller and jogger styles and they come in an array of colors in our pet gear collection. They are light-weight and collapsible for easy storage when not in use. Doggy In Wonderland's pet strollers and joggers are a great way to take your doggy with you on long walks or for a healthy jog. They are designed to safely contain your pet while still allowing your dog to be with you and enjoy the great outdoors. Pet strollers are designed for a more leisurely pace. They have protective pet compartments that allow for maximum ventilation and viewing while strolling. You can even use them for your kitty cats. Love to jog? Ever see people running with their children in joggers? Wish your special pup could do that? Now they can. Doggy In Wonderland's pet joggers are perfect for them. They include safety belts and cup holders! • Extra wide for larger dogs up to 150 lbs! • Folds flat for storage • Storage Pouch for all your ex.. Walk or Stroll with several smaller pups or even your bigger doggy! This stroller/jogger holds up to.. Happy Trails Pet Stroller - available in 2 colors! Wonderful Stroller For Pets up to 30LBS! Happy Trails Key Features: Parent Tray, Large Storage Baske.. Taking your dog with you has never been so easy and fashionable. Gen7Pets™ Pet Strollers are the.. Available in two colors...This limited edition 3 wheeled pet jogger stroller is perfect for a walk a.. VERY CHIC PET JOGGER THAT HOLDS UP TO 75LBS! This jogger is a great way to take your pet with you on.. Combining product innovation and fashion make these strollers a must have for you and your pet. You..
Next Generation AT3 All Terrain Stroller available in 2 colors! HOLDS PETS UP TO 60 LBS!!! This rugged Next Generation AT3 Stroller Features: • Front wheel fixed a.. 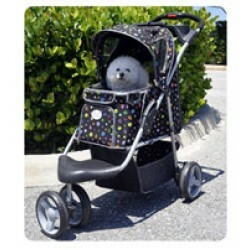 Your and your pet will love this gorgeous pet stroller for its comfort and ease as well as its great.. Available in 3 colors, This Regal Pet Stroller will shine as you walk around the neighborhood or loc.. PERFECT FOR LARGE DOGS! This is a great way to take your pet with you on a long walk through the par..
Special Edition Stroller - available in 3 colors! For dogs, cats and other pets up to 45 pounds! • Front center swivel for easy steering and a comfort.. Sport Pet Stroller - available in 2 colors! Sport Pet Stroller – For the On-the-Go Pet. Holds up to 20LBS • Protective pet compartment. • 600 d..
GREAT economical stroller!! The Pet Gear Travel-Lite Stroller ships completely assembled and can be ..